Lewis Hamilton is bored. 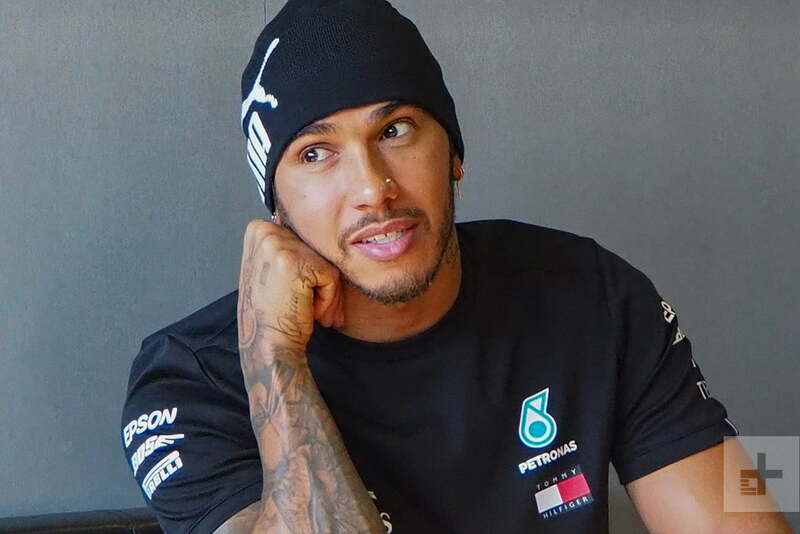 Nearly two dozen men and women swarm the Mercedes-AMG Petronas F1 car he’s poured into – it’s got more in common with NASA’s spacecraft than your average Subaru – but Lewis? He’s cool as a cucumber, waiting for the moment. The signal comes, and he guns the engine mere feet in front of me. I’m wearing Bose noise-cancelling earphones, and even through them I can tell there’s a thunder in the air; it vibrates through my body, while my other senses hum. The lights are white and clear, the air an even 65 degrees. The pit smells of cooked rubber, a sweet odor I sort of want to taste. Then there’s action: The crew backs away, the garage doors swing wide open, and we are on the track, the Circuit de Barcelona-Catalunya scant paces before me. A car races by in the blink of an eye. Hamilton eases his vehicle forward … then he is gone at 150 mph. I am left behind in my seat, surrounded by the smell of cooking rubber and excitement. The pit crew buzzes with activity: They’ve been testing a new tool, a battery-powered torque gun to remove nuts from wheels without the hydraulic cables that hang from the roof at every corner of the car. Hydraulic guns spin at 19,000 rpm, and they’re covered in sensors – the crew won’t tell me how many. The speed is itself a challenge: Drop a nut and it is weaponized, caroming off the ground and into the air at 50 miles per hour. Maybe the new tool can make it easier and faster to loosen nuts. It’s late February, and I’m at the track, watching the fastest sport in the world, with the most dominant team in recent history, hanging out with a man widely considered one of the greatest drivers of all time – the kind of guy who casually mentions surfing with his buddy Kelly Slater. But I’m not here for sports stuff. I’m here to talk about data. Decades ago, sports meant acts of individual or team greatness: speed, strength, agility. Michael Jordan’s prowess had nothing to do with instant replays and point-by-point analysis and everything to do with his innate skill. Likewise, Jack Nicklaus, or Joe Namath, or Jackie Joyner-Kersee. Modern sports bolster that natural talent with a layer of data thicker than the crowds outside Gillette Stadium. And there’s no way to ignore the how deep that relationship has become over the years. Baseball started with sabermetrics and Moneyball in 2003; today the statistician is the coach’s right-hand man, helping him eye players as hungrily as a ponytailed execs considering an acquisition. More than a decade ago, I wrote about the pair of Lenovo tablets the NBA used to record Paul Pierce jump shots. By 2013, half of the NBA had signed up for SportVu, which collects the location data of every player and the ball 25 times per second throughout an entire game. Here’s a thing you might not have realized: Data powers the sport of Formula 1 racing as much as the drivers themselves do. In F1 racing, the fastest road-racing cars in the world tear around grand prix tracks battling stupendous g-forces and the tightest of corners — sometimes with deadly consequences. Partnerships with companies like Pirelli are crucial, of course. The right tires can literally save lives. 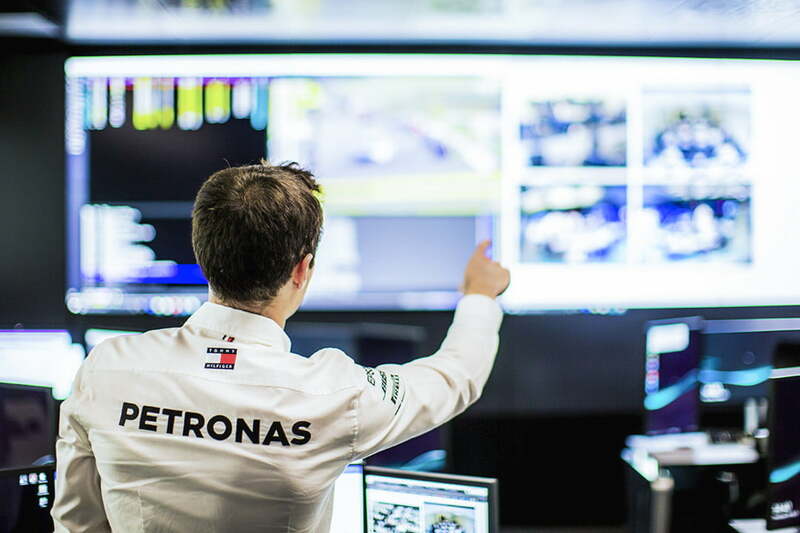 So too can the right data, which is why the Mercedes-AMG Petronas team has deals with companies like Epson, Hewlett-Packard Enterprise, and Qualcomm. An incredible array of sensors blanket every car, indeed, they’re baked into every component – even the tires are laced with embedded sensors. A crew will pull 2TB of data from a car in a single weekend of racing. The melt point of the tires is measured by integrated sensors. The scorching of the track is analyzed and recorded by thermal imaging cameras under the front nose cone. And thanks to Qualcomm, advanced radios using an array of frequencies and technologies beam that data to pop-up data warehouses for instant analysis. “More and more we’re seeing the compute element and the human element coming together. AI is better helping us understand the performance of the car,” Tom Fitzpatrick with Mercedes-AMG Petronas Motorsport told us. Data enables the team to pinpoint problems, step one in fixing them. Last year at the track in Singapore, Valtteri Bottas – another driver with the team — complained that the engine was dropping out in a certain spot. The engineers didn’t believe him, so he used a “record” feature in the steering wheel to mark the exact spot on the track where it took place. The engineers overlaid the data from the two laps and found the precise 12 microseconds in which the engine dropped out: Turns out, the track in Singapore runs over the subway system, and they needed to shield a sensor better against interference to fix the problem. That’s the power of data for you. But the drivers themselves? They’re not always so keen on data, which can be a double-edged sword. Just ask Hamilton. “I’m very old school. I prefer it with no data,” he told Digital Trends. “It’s almost like having a heart rate monitor on. Through the lap, there’s thousands of different sensors, and they’re literally recording to your heartbeat. 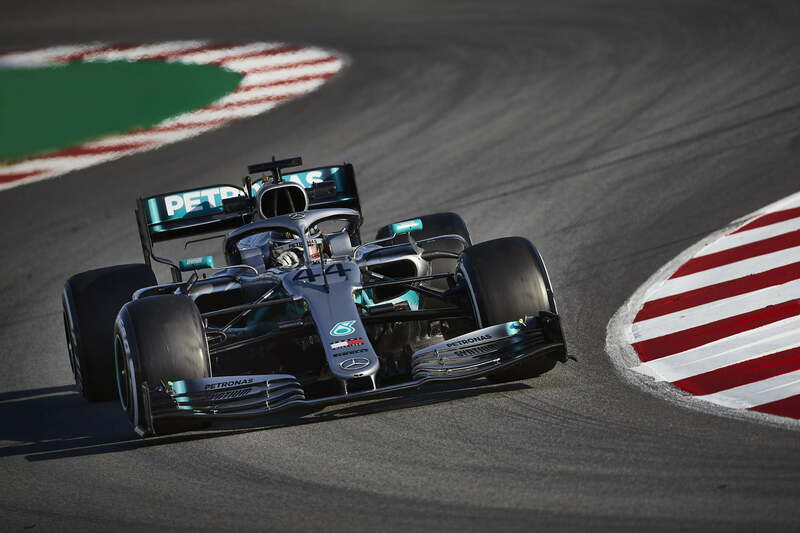 Every bump you use, every breakpoint you use, every curve you use.” And that data gets shared among teammates – making it far easier for someone else to ape Hamilton’s innate ability, he acknowledged wryly. “But the technology is amazing how it’s advanced,” he admits. “If we didn’t have all of that data, there’s no way we could move forward.” He’s particularly keen on data from the hydraulic differential, which controls torque independently to the rear tires. “I sit with my engineer and I have to understand it. So I don’t have a degree but I basically almost have a degree in that part of engineering, being able to engineer my car.” Hamilton wants the car to respond in a certain way. It doesn’t. With the engineers, he studies the data, pores over the numbers, finds the one tiny bit he can flip, and acts on it. “They’ll go back to the factory and redesign some things — and make the impossible possible,” Hamilton said. That vehicle that blew out of the pit before? It’s a new car. AMG Petronas spent 18 months designing it, the last few stress-testing and refining it through simulations and virtual track testing. Now we’ve arrived to see it finally put through its paces during the pre-season testing in Barcelona. Everything about F1 is a logistics challenge, from moving data off the car to simply moving the car itself. In addition to transporting the vehicle (via airplane), the team freights 40 or so tons of equipment between tracks around the world. The garage is built before the race, a week ahead or so. It’s torn down and transported to the next track immediately after a given event ends. For F1, tires are coddled in a way babies aren’t: They live in heated electric blankets – 100 degrees Celsius for the front, 80 degrees for the rear. (Really!) That’s almost as hot as boiling water, getting the rubber nice and soft so it beds into the asphalt. Sensors built into the tires themselves return data about the road, the grip, and so on. Pirelli, the sole tire supplier of F1, brings three different compounds of tire to every race. Softer tires give more grip, but won’t last as long; harder tires give better performance but won’t offer as much agility. Think it doesn’t matter? There’s about a 0.6 or 0.7 second difference around a given track based on the hardness of the tire. And that type of difference is exactly what all of this data is meant to tease out: Which nose cone reduces drag by a fraction of a second? Injecting a bit more fuel at a given point in a turn helps how much? Every fraction of a second is meaningful, meaning every second of data is priceless. It snowed unexpectedly last year and the team lost a full day of data, a beautiful yet heartbreaking setback. So what data exactly is being captured? The Circuit de Barcelona Catalunya (Catalunya for short) is a very good circuit for data, combining straight sections the drivers can hurtle down with high speed curves and slower, technical sections – everything a data junkie needs to feed his need. Consider turn one, the heaviest braking point, which follows a straightaway after the finish line. Slam the brakes on and the car goes from about 210 mph down to 150 for a 90-degree right-hand turn. Hit the gas again through turns two and three and the car leaps forward as it hugs the track, centripetal forces tearing at the car like crazed demons. Suddenly, the driver is enduring as much as 5.5Gs – five and a half times the force of gravity. If you’re lucky enough to leave the planet in a space ship, you’ll deal with 3Gs. F1 drivers must endure nearly twice as much. What does that do to the body? And just as important, how does the car handle it? How do the various parts do – the tires, the nosecone, the 1,500 or so pounds that make up an F1 race car (driver included)? 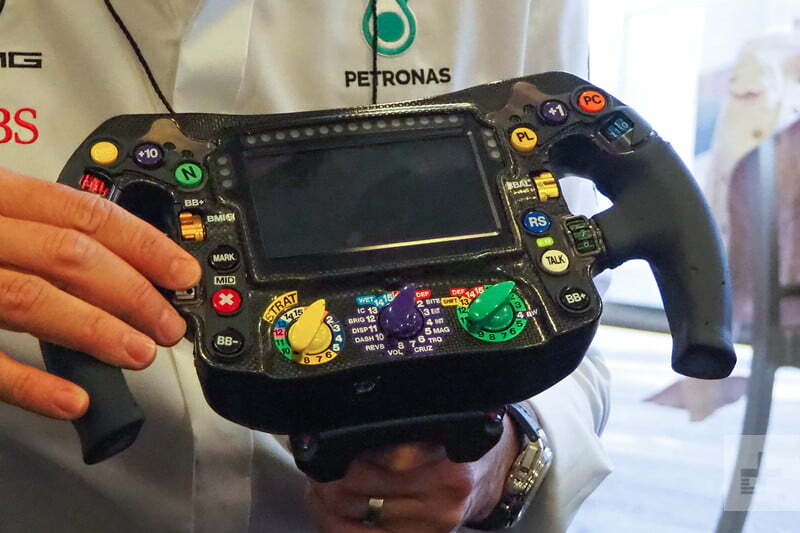 Through a vast array of sensors, AMG Petronas measures and records everything to find out. Where does the data go? In the pit is the most advanced data storage system you’ve ever seen: redundant Pure Storage SANs, racks filled with arrays built from 3.6TB flash drives, 40 to 60 terabytes in total, with the critical info synced between SANs (high availability and all of that good stuff). “The amount of storage we’ve got is mind-blowing,” one team member told me. It’s hard to imagine how priceless that data is, so consider this fact: The team upgrades a part for the car or makes a performance improvement every 20 minutes based on it. Getting data off and into the on-site lab as fast as possible is crucial. Using a 5GHz network, AMG Petronas is able to start offloading data as the car rounds the turn and nears the pit crew. As the car pulls in, the network hands off to a local 60Ghz Wi-Fi network (a technology called WiGig), which uses the same unlicensed spectrum that 5G is built to take advantage of, explained Caleb Banke, a senior marketing manager with Qualcomm’s Wi-Fi team. “We can get 10Gbps over that, with very very low latency, like sub 10ms sustained,” Banke said. In other words, that 5G phone you’ve been eyeing? It’s not just 5G fast. It’s F1 race car fast. It’s 200 mph, 5.5Gs fast. It’s checkered flag fast. And that’s fast enough for Hamilton.